We have been developing high sensitivity, high spatial resolution magnetometry techniques for applications to geologic samples. Scanning superconducting quantum interference device (SQUID) microscopy (Weiss et al. 2007; Lima and Weiss 2009, 2016; Lima et al. 2013, Baratchart et al. 2013) maps the vertical component of the magnetic field above room-temperature geologic samples with a moment resolution of of 1e-15 Am2 and a spatial resolution of 100 μm. This performance is about ~1,000 times and ~100 times, respectively, better than existing superconducting moment magnetometers. This allows us to directly map the three components of the magnetic field of individual grains and textures in thin sections. We have been collaborating with groups at Harvard to develop quantum diamond microscopy (QDM), which enables maps of all three field components of room-temperature samples with a spatial resolution of better than 4 μm (Fu et al. 2014, 2017; Glenn et al. 2017; Weiss et al. 2018). 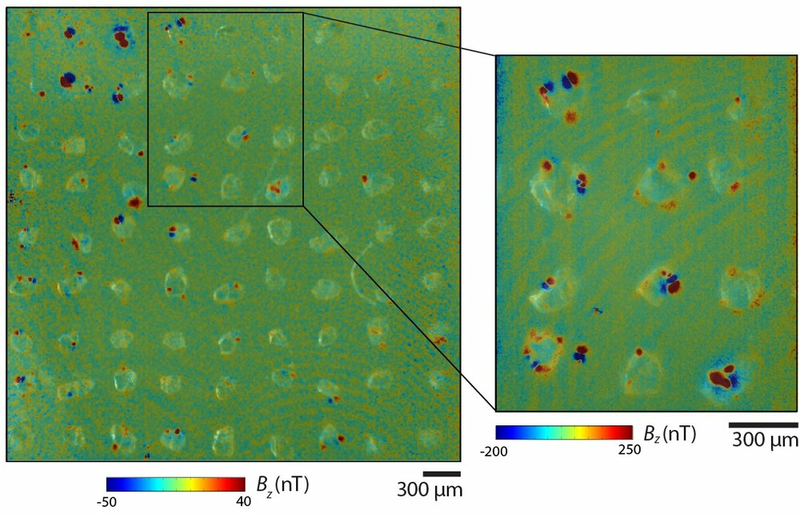 We have also developed a scanning magnetic tunnel junction (MTJ) microscope (Lima et al. 2014) that achieves a spatial resolution better than 7 μm with a moment resolution of 1e-14 Am2. This represents an improvement in sensitivity by a factor between 10 and 30 compared to similar scanning MTJ microscopes based on conventional bias-detection schemes. Over the last decade, we have used magnetic microscopy to adapt standard paleomagnetic techniques like thermal and alternating field demagnetization (Fu et al. 2014), paleointensity methods (Weiss et al. 2007; 2008), conglomerate tests (Fu et al. 2014), and even magnetostratigraphy (Oda et al. 2011) to microscale samples like meteorites and single silicate crystals.